I am fairly new to FEA analysis and could not find answers to my questions online. I need to do a structural analysis of a assembly made of tubing but the results I get are concerning so I went back to basics. When I do the FEA of a beam, the results are as expected but when comes to tubing the results are worrisome. The local stress/deformation skyrocket and make me wondering what I am doing wrong for the tube. Is it the way I apply the force? constraints? or something else I do not understand? Again, your wisdom is more than welcome. Cap the tube and see if the results are more agreeable. The deformed results look correct for the loading. You have put what was a high load for a solid block onto a thin wall; If you were to make a similar shape of aluminum foil it would fail just that way. Moved the force to the cap surface so it does not crush the edge. Results are slightly better but still off. Based on hand calculations the max stress should be around 341 psi and a the total deflection around .00056 in. The stress peak of 541 psi is localized but is there a setting or rule of thumb you use in CREO to ignore local stress and yet have results in line with hand calculations?This analysis is simple but when comes assembly it may be hard to figure out what to ignore. The tube deflects more 50% more than it should be which makes me wonder how that is possible as with the capped ends it should either be equal or slightly less. Any ideas what else I could change? Capping was to provide support for the load on the weak edge of the top face, preventing a realistic but distracting deformation. Other sources of problems are unrealistic transitions; hand calcs don't often include stress concentrations that will appear in finite element methods. In real parts local yielding will often spread concentrated loads. I've typically used FEA to find unexpected stress concentrations and the qualitative deflected shape rather than as a stress analyst to verify actual stresses. The analysts I have worked with generally ignored stress analysis artifacts and ensured engineers eliminated sharp transitions that lead to stress concentrations. Thanks for the models, however, I only have the lite version and cant run the sims. Would you be able to provide me with the results so I can compare? Would you know why the results seem different? 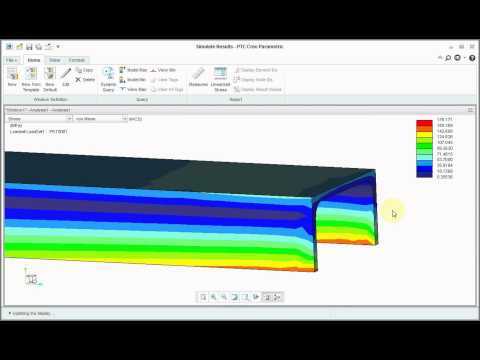 I would use the beam tool to run a beam analysis in creo simulate.